Make sure the computer that is running VirtualBox has a stable connection to the Internet. Open VirtualBox, but do not start Android-x86 yet. Select your Android-x86 virtual machine and click Settings. Select Networking and ensure Attached to: is set to NAT. 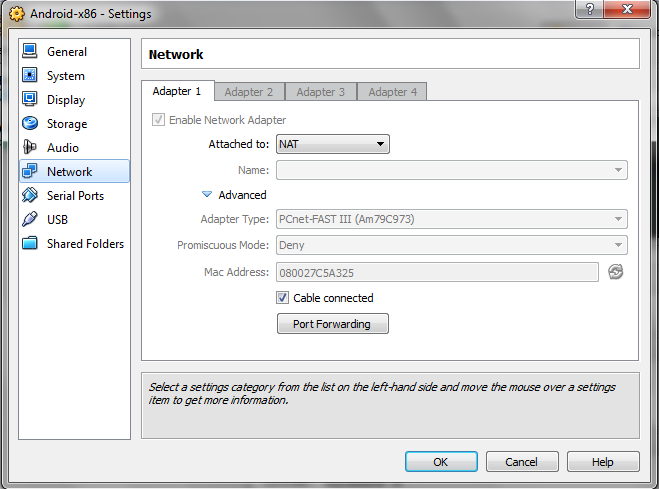 Click Advanced and make sure your Adapter Type is set to PCnet-FAST III (Am79C973). Mine was set to Intel by default, and this is what kept me from getting connected for so long. Once booted up, hit Alt + F1 to open the Android console. Type ifconfig eth0 up and hit enter. Type dhcpcd -LK -d eth0 and hit enter. Type setprop net.dns1 [DNS IP] and hit enter. Replace [DNS IP] with the IP address of your DNS server. This is typically your router's IP address. So, for an average home Linksys router you would type setprop net.dns1 192.168.1.1 and hit enter. Press Alt + F7 to return to the Android emulator. Obviously, an Android emulator isn't worth much if it can't connect to the Internet unless you're a developer. This process of tweaking the VirtualBox network settings got the Internet working for me on Android-x86, and hopefully it will work for you too. well this did work for browse the web but I still couldn't go into setting and then add an existing/new account (google account) is that something not at all possible in the vbox emulator? is there any option to connect internet using proxy?? pof free dating app POF Free Online Dating is an official app from the eponymous dating service that lets you reach millions of users who have interests similar to yours.